We love making handmade ornaments. We’ve created many types over the years from salt dough to ceramic to applesauce & cinnamon. But my very favorite kind to make are made out of our chicken eggs! Designs are only limited by you imagination- you can paint them, decoupage them, use stickers or chisel out a design using a Dremel. 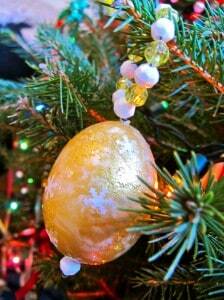 Egg ornaments are easy to make and fun way to spend the afternoon! You start by blowing the insides out of the egg. Now I am sure there are a million ways to blow out the insides of an egg. I have seen special gadgets to buy, I know people who use a bulb syringe. I even know some one who tried an air compressor (please, don’t try that one…it’s not pretty). But personally I find it easiest to just use your mouth. I am using fresh and clean eggs so I am not worried about bacteria. I simply tap a hole in each end of the egg, scramble the insides a bit with a needle and blow. Once they are free of egg, rinse them out and allow them to air dry or stick them in the microwave for a few minutes. Then they are ready for decoration! The sky’s the limit when it comes to decorating. Since this is a kid-friendly ornament craft we usually use acrylic paint. My favorite is to paint a solid color and use our snowflake paper punch to decorate on top of the wet paint. We have also rolled the eggs in glitter, used stick on decals or used sharpies to draw designs on the outside of the eggs. Once your design is complete cover the eggs with a couple layers of Mod Podge, which helps protect your design as well as add a little strength to the egg shells. Once your eggs are dry, they are ready to hang! You can use ribbon or yarn, but I use wire and beads. Loop one end of your wire and place a bead on this will keep the egg from sliding off the wire. 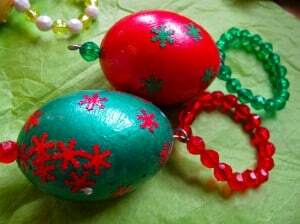 Place the egg on the wire and then make a pattern of beads about 4-6 inches in length. Bend the beaded wire over and using pliers bend the end of the wire and secure it to itself just where it emerges from the egg. Now repeat until you have an entire collection! Hang them on your tree or give them out as gifts for Christmas! So pretty! I don’t think I’ve ever seen these before! Those are lovely! I know the kids would love making some of those. we would make these when I was homeschooled every year….brings back so many good memories!!! beautiful!!! That is simply lovely! So simple and elegant. Thanks for sharing. So pretty! I would have never thought to do this for Christmas, but I guess eggs don’t have to be just for Easter! So creative! How can you cut it out and decorate it? I had a nativity scene and it was broken, so now I need to make another. this is my 1st time making the blown christmas eggs i hope i can get the egg out but iam going for it .. how do you make salt dough?